Vegan Meatless Loaf - Why would anyone want to do this? Well, it's even easier than regular meatloaf and doesn't hurt any animals. After quite a bit of tinkering, I think I finally have a version we all enjoy. Unfortunately we ate it so fast I never got a picture. Our Free Garden Cold Frame - Adventures in recycling. DIY Rain Barrels - They're so easy you'll want to run out and get the stuff to make your own! And finally - I am working on getting our seeds started and will have some tips for creating your own mini greenhouses. I hope your house isn't getting hit as hard as ours with all the illnesses floating around this year. ooooh cold frame! Can't wait for a pic! 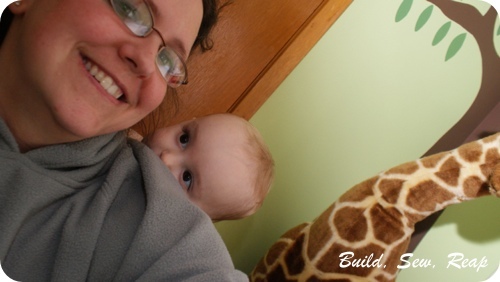 I had great plans to build one last year, but being pregnant trumped my plans! But I did throw together a wonky "test" version. Sadly, it only worked until it got below zero! But now I know!